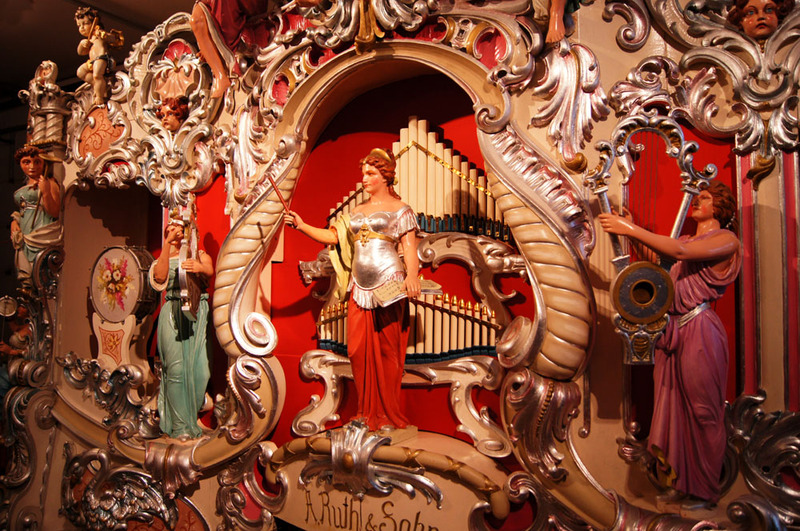 This magnificent 96 keyless A. Ruth & Sohn organ was built in the Black Forest town of Waldkirch, Germany, to the order of a travelling showman named Hattenhorst. An inscription in the bellows is dated February 26, 1907. This organ is reputed to be the last with which Adolf Ruth I was personally involved, for he died shortly afterwards, on March 21 of the same year. Having somehow survived the ravages of the Second World War, the instrument was acquired in 1949 by a showman in Berlin. Eventually, his son became the organ’s owner, and it was often used at fairs alongside his Dodgem track. Restrictions enforced by the East German authorities limited what he was able to do, but the owner did succeed in acquiring some new music for it from Carl Frei, and was also able to have the façade re-decorated. 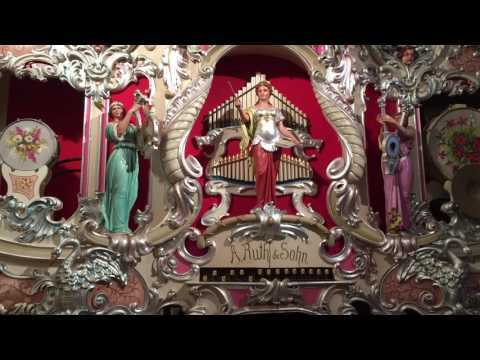 After the Berlin Wall fell in 1990, the organ became known to a number of collectors, but it was Jim Krughoff who eventually succeeded in acquiring it in June 2002. It was shipped to the United States in its original showman’s display trailer and set up at his home near Chicago. Its travels were not at an end, however, for it was discovered on further inspection that only a comprehensive restoration could bring the instrument back to its proper playing standard. 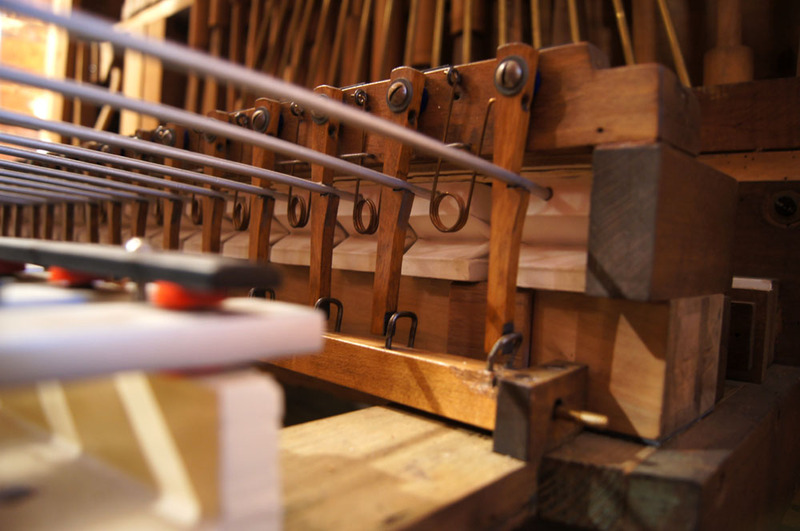 Work in progress on the model 38 Ruth organ: covering the channels in the boards which supply wind to the violin and flute pipes of the melody division. 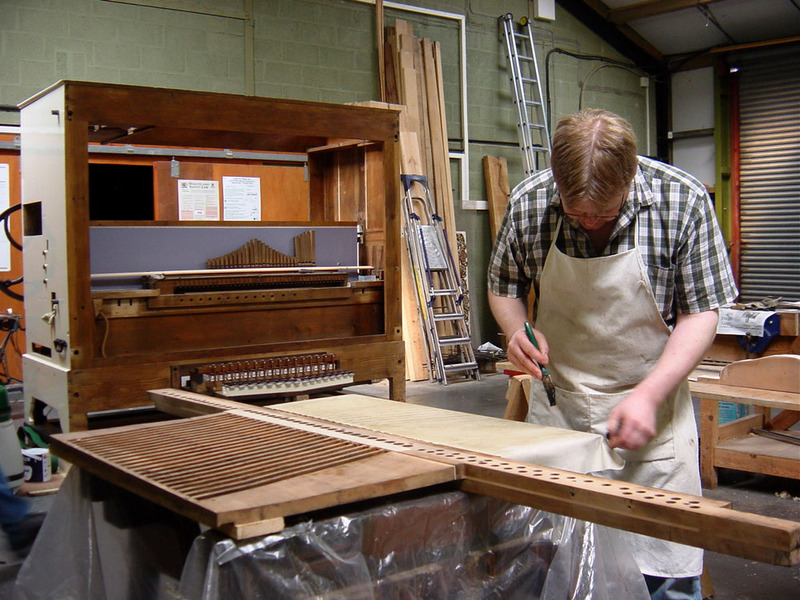 In the background stands the restored organ case which already has the bellows, wind chest and other components installed. Note the glockenspiel unit, located at the lower centre. A close-up of the glockenspiel action. 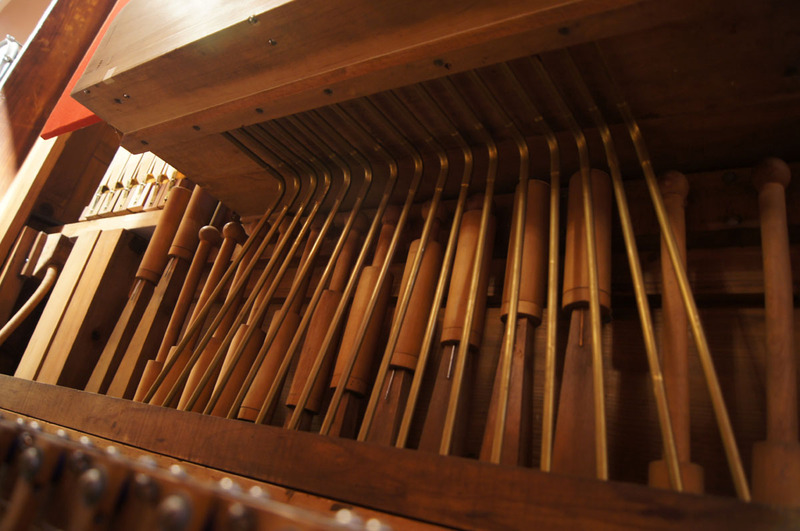 The totally original condition of the organ had been a major factor in Jim Krughoff’s decision to add it to his collection. Perhaps the scarcity of organ builders in the communist state and a general lack of money there had spared the instrument from later enlargement or ‘improvement’. 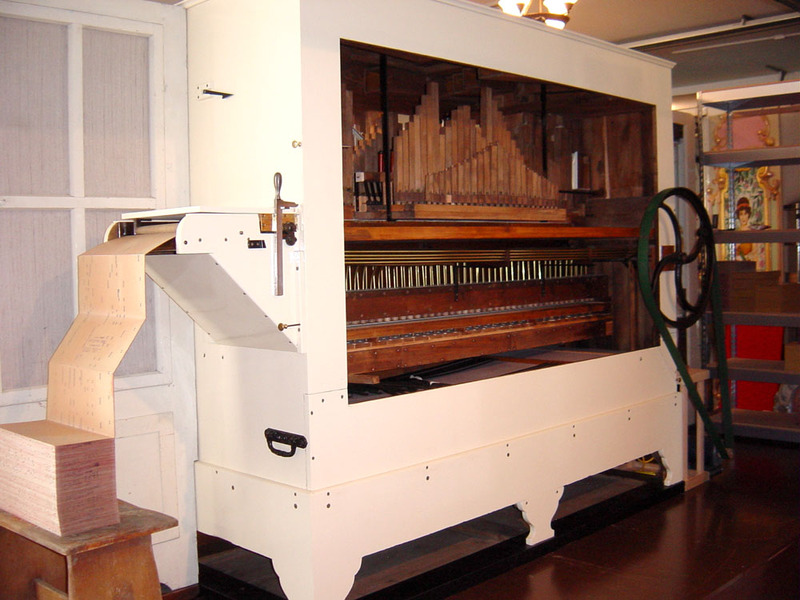 Anxious not to spoil the integrity of the instrument, the task of restoration was entrusted to AC Pilmer Automatic Music Ltd. and the organ was shipped to England, where the work was carried out over the next couple of years. All the connections from the tracker bar to the primary action are in brass tubing which, due to corrosion, had to be replaced. Below the primary action can be seen the pouch board and main wind chest. Every part of the instrument received attention. The open flue pipework had particularly suffered from unsympathetic handling in the past and much care was bestowed on returning it to its original state. The wind pressure had been increased and this was returned to its correct level. The work also involved the complete overhaul, repair and re-leathering of the large bellows (‘pump’ to our readers in the United States), wind chest, glockenspiel and primary action; in all many hundreds of hours of work. A careful tuning at the correct pitch and to the original temperament completed the job. During this time, the façade and figures remained in the USA as the decorative work of the 1980’s is still in very good condition. The organ was premièred in Chicago in July 2006 in its restored state. 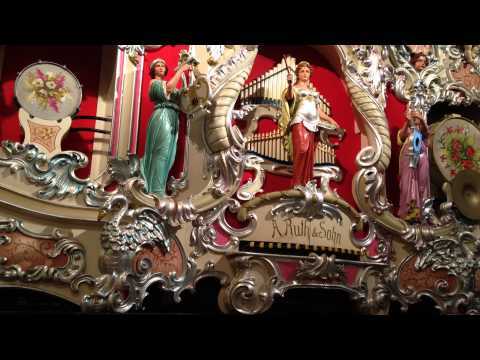 Its majestic, dignified sound, optimally balanced between the silvery upper work of the mixture and the deep, full, rounded trumpets and trombones is an example of the very best in German fair organ building. Rear view of the Ruth in play. The music books pass from the keyframe, through the organ case and stack up at the opposite end. Ruth organs are highly regarded for their well-chosen instrumentation, high-quality pipework, outstanding tonal balance and dependable pneumatic action. In combination with tracker bar scales designed with the type of music to be played in mind, and arrangements of the very highest calibre, these factors established the firm’s reputation as the premier fairground organ builder in Germany. 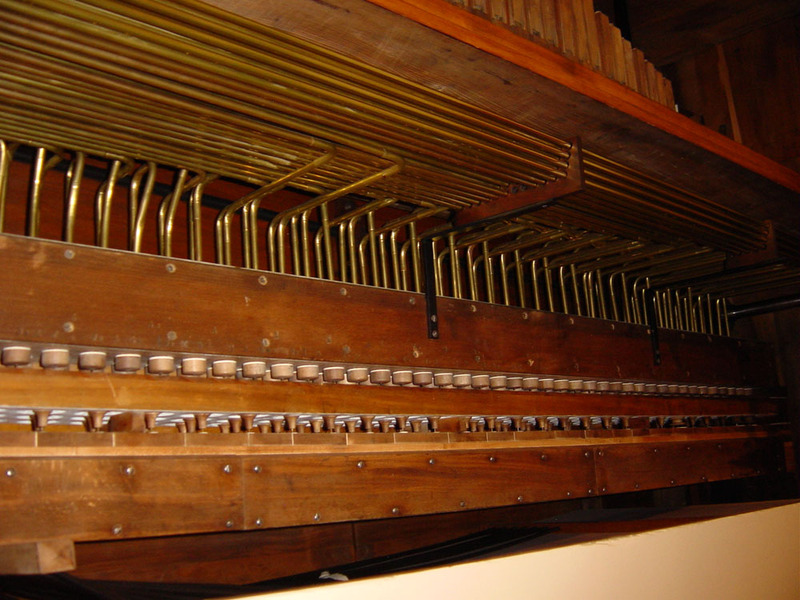 A view showing the 16 brass tubes which carry the action signals to the glockenspiel unit, which can just be seen at the very bottom of the photograph. Behind them are some of the trumpet pipes. Jim Krughoff ordered around 1300 metres of new books, which we punched from the original patterns of the Ruth firm and Gustav Bruder. For this scale, Gustav Bruder produced some of the finest arrangements of operatic overtures and fantasias, concert waltzes, characteristic pieces, selections from operettas, marches etc. ever made for fairground organs. Such repertoire elevates the fairground organ to that of a convincing interpreter of serious music. The Krughoff model 38 Ruth organ plays the overture “La dame blanche” by Boieldieu (1825) in an original Ruth factory arrangement.